Hey guys! 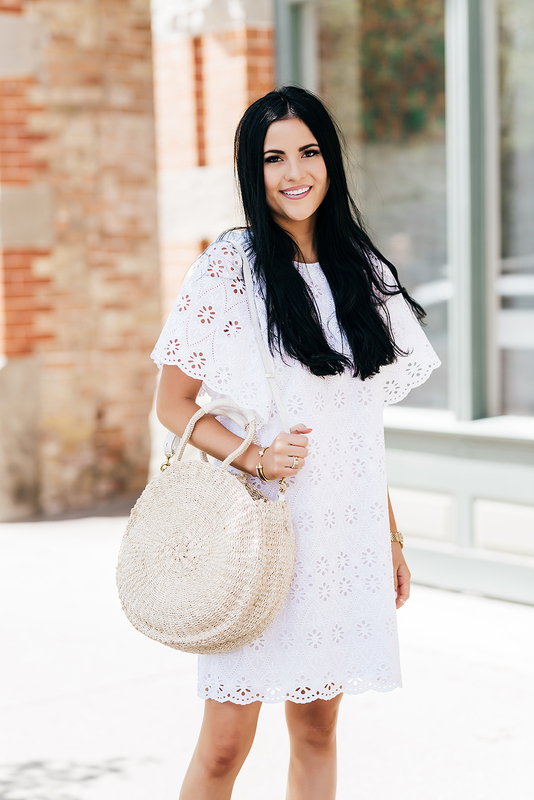 One of my favorite things to wear in the summer is white flowy dress and so when I found this one at Nordstrom last week I knew it would fit right in with my wardrobe! I couldn’t wait to wear it with these cute bow sandals and tote to create an effortless, summer-ready look! You can shop everything in the widget below and I’ve also linked a few other white dresses that I’m loving! Thanks so much for stopping by, have a great Tuesday!! White dresses are the best during the summer! I love your dress and the bow sandals are darling! I love that cute bag and those yellow slides :) Everything is just so pretty here! Love this entire look. The sandals are so cute. Such a cute dress! I have been obsessed with eyelet this spring! I love the eyelet details on this dress, it’s one of my favorite details for a summer a dress! It makes it that much more breathable and also adds a little something extra to a simple white piece. I love the way you’ve added a small pop of color with those adorable sandals, too cute! Thanks for sharing and Happy Tuesday! This look is SO adorable! Love who you added the pop of color with the Kate Spade sandals! Love your dress! It’s so cute and can be worn for so many different occasions! I totally agree!!! Thanks Ann-Louise! Love this summer look on you, lady! Those slides are the cutest! Love the outfit and the pop of yellow! best accessories!!! loving the slides! the straw bag is so cute! Love those yellow kate spade slides they are perfect for Summer!! Love, Love, Love this handbag and I have been on the waitlist for it. You styled this lace dress so nice with the yellow and mixing in the straw bag. As always you look gorgeous. It’s the best bag! You will LOVE it! Thanks girl!! It’s my favorite lip combo right now! I love the dramatic sleeves on this dress and yes it is perfect for summertime! I love love love this dress Rachel!! You look beautiful and bronzed!